I now have a Big Shot of my own. YAY!!!!! I've actually had it for about 6 weeks or so. It has been so much fun playing with it and getting to use it to create perfect circle and ovals as well as amazing perfect touches for my cards. During the January class, we used it to create a card like the one above. I was inspired by a card I saw on Pinterest by Barbara Mullally. I loved using the Bloomin' Heart Thinlit on the front of a gate fold card. I'm really glad I also had the Precision Base Plate and the Big Shot Die Brush. This is a very detailed and delicate thinlit. Even using those, it still required the use of a paper piercer to push out all the cut away pieces to show the intricacy of the heart. It was fun to then decorate the heart with cut out flowers in Very Vanilla and enamel dotes and pearls. You can't see it in this picture, but we did stamp a sentiment in Basic Gray on the bottom panel. I know this very card was used for very different occasions--Valentine's Day, birthday, and baby shower. That's the great thing about hand made cards, they can be personalized for whatever you need and each one will be unique and special because they are all slightly different. The Global Design Project 075 theme made me think about my very first projects as a Stampin' Up Demonstrator last summer. So, I went on a trip down memory lane checking out the projects I made using the Papillon Potpourri stamp set. I found this card and thought I'd share it with all of you. This was my very first attempt creating card using stamping and a card made using one of my favorite techniques. 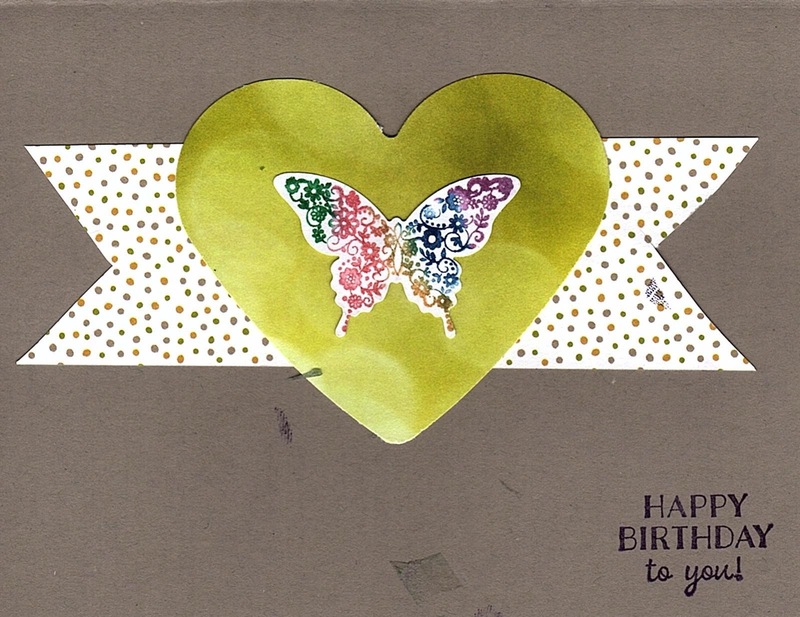 I used the 2016-2018 In Color Markers to create a multi-colored butterfly stamp. Here is a pic of my first attempt at this card. Then I created a new card base from Early Espresso and used Soft Suede ink to stamp around the edges of the Crumbcake card front. I tried to just move the banner, heart, and butterfly from one card to the other to save on Serene Scenery DSP. The banner did rip a little so it ended up uneven, but I still liked the card and really had fun learning new techniques. It was so much fun taking this photo trip down memory lane and seeing how my cards have grown and changed over the past few months. 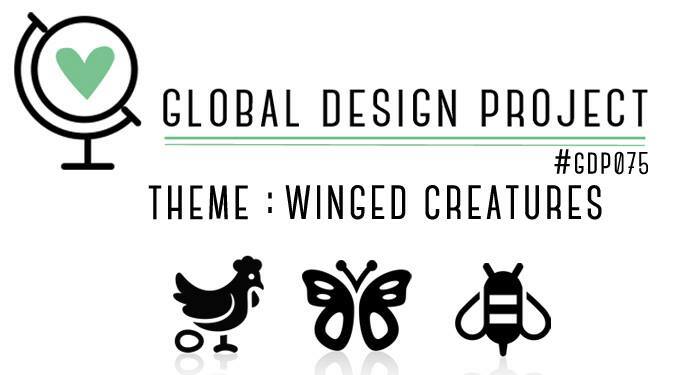 The Global Design Project is a theme project this week. I've always been a bit partial to butterflies. In fact, the stamp set I used for my very first workshops and classes was Papillon Potpourri. 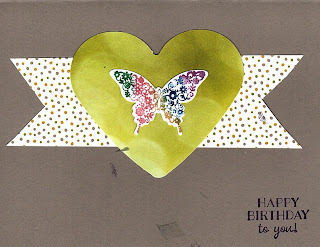 It just made sense to me to use butterflies for this project as well as a bee stamp and feature some of the products available on Sale-a-bration. Check out all the other cards created by the Global Design Project designers and other participants. It's Thursday again and time for yet another video. Today I showed a couple more Sale-a-bration items and made a card featuring them as well as Serene Scenery DSP. Please subscribe to this blog and to my YouTube Channel to get notified when I post something new. I've played a lot with the Falling Petals Embossing Folder from the Occasion Catalog. I thought I would share a few cards I've made featuring that folder. I used this Embossing folder while I was creating several Valentines this year. I used this card during my card class at the end of January using the hearts made from Falling in Love DSP and Blushing Bride Glimmer paper. Everyone at the class could choose which designs and how many hearts they wanted to use for their cards. One customer chose to only use the Blushing Bride Glimmer heart to decorate the front of her card. I was inspired to make my birthday cards this month, the same way. Thank you Janice. I love how we can be inspired and learn from each other. 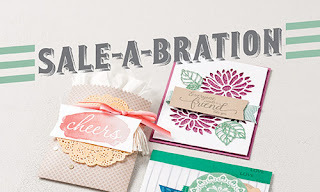 Three new Sale-a-bration items became available today. 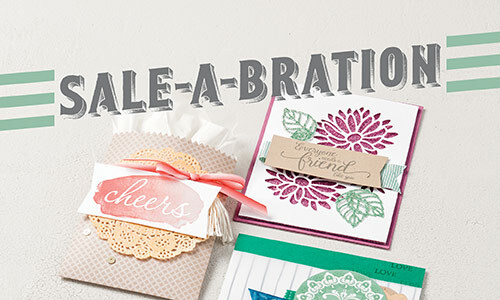 All Sale-a-bration items are now available until March 31. For every $50.00 order you place (before tax and shipping) you may pick a Sale-a-bration item of your choice for FREE. Here are a couple cards I have made using Sale-a-bration products. I will be working on more and getting them posted on this blog within the next couple of weeks. Stay tuned. It is President's Day in the United States. I thought I would make a patriotic card in celebration today. This is what I came up with. I love the Birthday Blast bundle and the way the stars just pop out of the card and add dimension. You can't really tell in the photo, but I was attempting to create the look of fireworks in the background by embossing splashes from the Work of Art series with gold embossing powder. I even put some red, white, and blue stars on the inside of the card to continue the patriotic feel. If you'd like to add a sentiment to the card, I found that on one of the white stripes at the bottom of the card is a perfect place for whichever sentiment you need. Here is an example with the embossing on the inside instead of the outside. Which do you like better? I am starting an exciting new class opportunity. Each week I've been having a Facebook Live video on Thursday afternoons at 2pm CDT. Starting in March, I will be offering a product based class each month. We will be making four cards per month. Receive all products needed to make two cards--including Swirly Bird thinlets you can choose to use or not. Receive paper products needed to create 2 cards.. You can create design for your Easter eggs using your own creativity. Card I create on Facebook Live video this week will have different design than the ones seen. Receive products needed to create 2 cards. You can design art for the front panel using your own creativity. Card that I create on Facebook Live video this week will have different design than the one seen here. Decorative paper will be from Playful Palatte Designer Series Paper, but may differ from one's seen in photo. You can create right along with me while watching the Facebook Live Video or watch the recording later on Facebook, YouTube, or this blog. The ink colors I used are listed if you'd like to use the same colors. Other colors may be substituted. These cards are your creations. Feel free to be a creative and change whatever you would like. Order the Work of Art stamp set and any ink colors or stamp blocks or adhesives you need. Contact me with any questions. 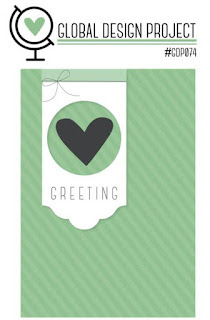 Cost: $3.00 per week for card kit needed to create 2 cards of the one design OR $10.00 for subscription for entire month. Class attendees will also receive additional card ideas throughout the month using the Work of Art Stamp set. Those card ideas will not be released on social media or to the general public until April. The colors for Color INKspiration 03 were so much fun to play with this week. They instantly bring a sense of calm and relaxation. 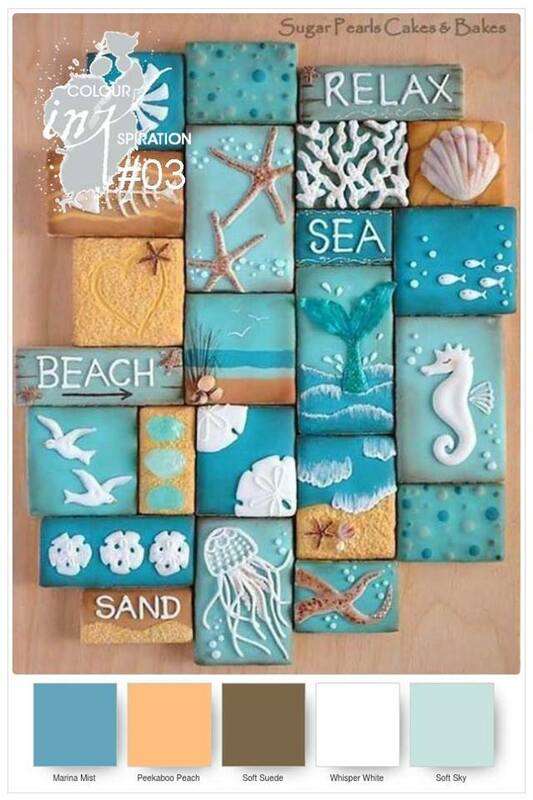 (and I'm not even a beach loving girl). I have been thinking Spring and Easter a lot right now, and was thrilled this color palate worked out so well for those cards as well. I created the Cross with stamps from the Work of Art stamp set and love the frame around it. I used the Pretty Paisleys Embossing Folder from the Holidays catalog. It was the perfect frame for the cross, especially when the embossing was sponged with the same colors as the cross. I love these colors together and used Soft Sky as my card base and Whisper White as my stamping and embossing top layer. Marina Mist DSP from the paper stack was the layer between the card base and framed stamp. I stamped the cross and sponged the embossed frame in Peekaboo Peach and Soft Suede. My favorite thing about a color challenge is that I don't look for color combinations outside the challenge parameters and that helps me put a card together faster since I have limited my choices. What is your favorite thing about a color challenge? Global Design Project 074 is another sketch challenge. 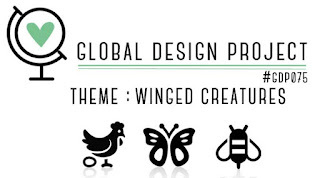 I've played along enough now to know that the sketch challenge is my favorite of the Global Design Project challenges. So, I am always excited when this challenge rolls around. I love the soft colors of the Falling in Love DSP as well as the Easter message stamp set. I had so much fun making a card to celebrate Easter. I just learned today how to only cut part of a Thinlit with the BigShot, so I could use the the Tags and Labels Thinlits to make the tag as long as I needed it for this project. The length of the tag was the one thing preventing me from finishing this project earlier in the week. I just didn't know how to make a tag long enough for the stamp I planned to use. The timing couldn't have been more perfect to learn how to make tags of any length. I added the color to the cross stamp with watercolor pencil and blender pens and the added the purples to the draped cloth with Aquapainters. I think there must be something to the idea that coloring is therapeutic for all ages. I am loving using the different tools available through Stampin' Up to add a personal touch to my cards as well as some therapy time for myself. I did not have these alternative cards all done in time for my video last week. But, as promised, they are done now and the pictures are available on this blog. I actually finished with lots of supplies left that I can use for other projects because I had all my Valentine's Day needs complete and it was time to move on to other projects. Here are the pictures of what I created. I made these cards plus seven treat bags and even a couple of cards I gave before getting pictures. And, I still have lots of all products available so I can make even more in the future. If you sign up as a Paper Pumpkin customer through me, you will have access to these alternate ideas before they are available to everyone on my blog or other social media platforms. I had a lot to show you on today's video. We looked at the Sale-a-bration items that I happen to have, including the Glimmer Paper Stack that becomes available on February 21. There will also be a couple of new stamp sets available then, so be sure you check them out. 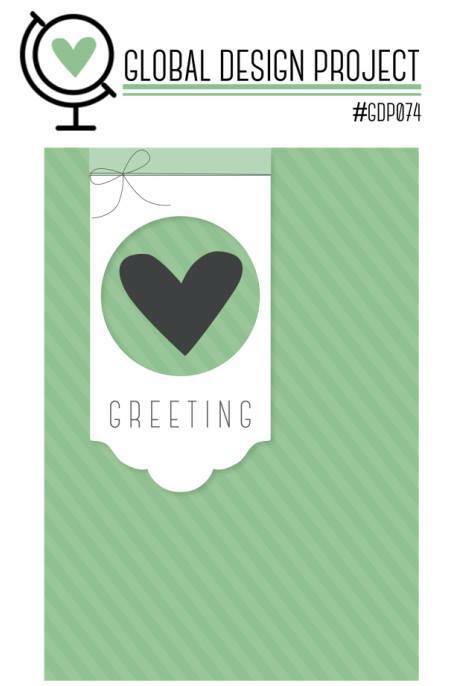 Then, you get to see a sneak peak of the cards we will be creating during the online class in March . You will be able to create along with me during the Facebook Live Videos in March or later with the recordings. Photos of the cards are now available on the Facebook Invite and will be up on this blog soon. Finally, I got to create a card using the Inside the Lines Sale-a-bration DSP and Watercolor Pencils. Enjoy the video if you missed it live or would just like to watch it again. I did finish up the inside of the card after the video was complete. I hope you're having a wonderful day (and week) filled with both giving and receiving love. I hope you've had a chance to stamp and share some cards with friends and family. I love you all and just felt like telling you that today! I have recently joined a challenge group on Facebook--Colour INKspiration Challenge. 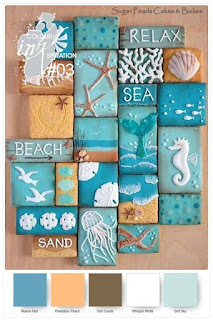 It has been so much fun to be challenged by color combinations as I am creating cards. As I was reviewing my blog, I just noticed that I have only been submitting my cards for that group on their Facebook page and have not shared them on this blog. Well, I am about to remedy that. There have only been two challenges so far, so I'll put them on this post and then create individual posts in the future. CI02 was a challenge of lots of bright colors: Blushing Bride, Mint Macaroon, So Saffron, Sweet Sugarplum, Tempting Turquoise, and Peekaboo Peach. For this, the first challenge, we could pick any thee or more of the above colors. I chose Sweet Sugarplum, Blushing Bride, and Peekaboo Peach. I used the sketch from the Global Design Project of the week and tried to get this card finished in time to enter #GDP070 as well, but I missed the deadline for that challenge. I did do a blog about this card and other baby cards inspired by that challenge. CI03 was for the colors Wisteria Wonder, Soft Sky, Mint Macaroon, Whisper White, and Garden Green. I did not have any Mint Macaroon so I was given permission to substitute Pear Pizazz. I really struggled with this color challenge since I kept thinking it would be best used creating a beautiful, floral picture. But, I did not have any stamps at that time that matched the picture in my head. And, I only had ink in Garden Green and Whisper White anyway. So, I did what I think we all do at least once in our card making lives and I turned to Pinterest for inspiration. With the paper I had in the challenge colors and inspiration from Pinterest, here is the card I created. Once the card was created, I knew it needed the frog "thinking of you" stamped on the inside, but it was in a box on its was from Stampin' Up so I just had to wait somewhat patiently until it arrived and I could finish the card. I think it needed that frog on the inside to give it just the special touch it was missing.